What Can Parents Do About Kids' Persistent Nosebleeds? | Checkup | Kids VT - small people, big ideas! Nosebleeds are a messy part of childhood. They can be a frightening experience for children, especially the first time, but usually they're nothing more than a minor nuisance that stains kids' sheets and clothing. But what if nosebleeds happen frequently? Dr. Richard Hubbell, a pediatric otolaryngologist — or ear, nose and throat specialist — at the University of Vermont Medical Center, offers reassurance and advice for stanching the flow. KIDS VT: What are some of the most common causes of kids' nosebleeds? RICHARD HUBBELL: It's certainly seasonally related, and worse in the wintertime and during allergy seasons. The air in your house is so dry; it's like a desert. So the lining of your nose dries out and breaks a blood vessel. The vessels in the nose are very close to the surface. 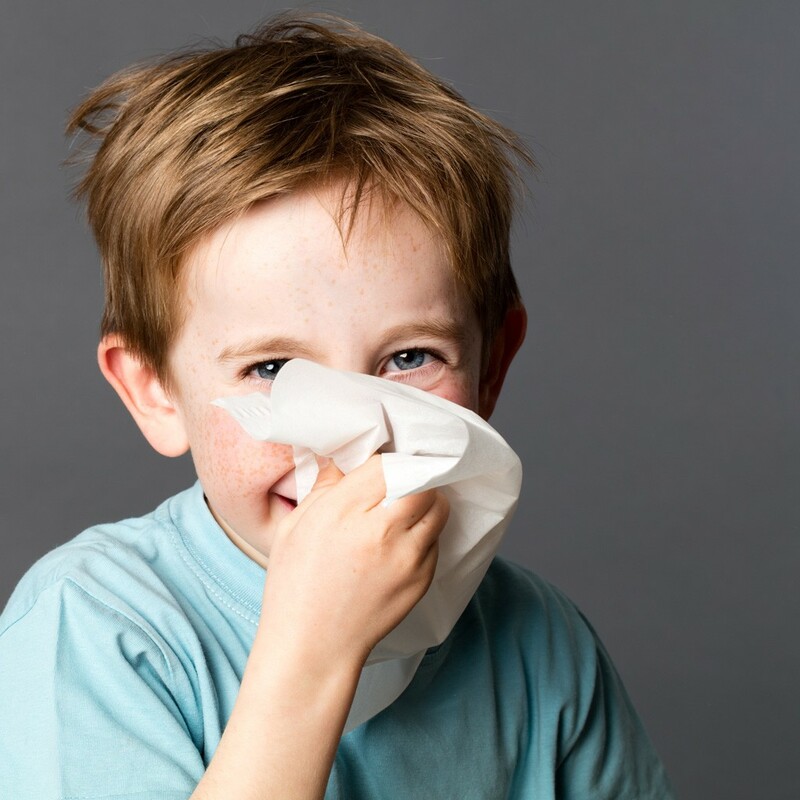 Nosebleeds tend to be more common in children than adults because they have thinner mucus membranes. KVT: About what percentage of kids suffer from regular nosebleeds? RH: I'd bet a good 5 percent of the population. KVT: What should the first response be when a nosebleed occurs? RH: The child should sit up and apply pressure on the lower half of the nose, below the nasal bones. If you squeeze on the nasal bones, you'll squeeze until you're blue in the face. Nine out of 10 nosebleeds come from the lining on the inside of the front of the nose, so just like any bleeding, pressure is the way to go. Tip the child's head forward for five to 10 minutes. If you tip it backward, the blood is going to run down the back of their throat. To prevent re-bleeding, don't pick or blow the nose, and don't stuff anything into the nostrils. If the bleeding continues after 10 minutes, pinch both nostrils with the thumb and forefingers for another 10 minutes. If the bleeding continues, go to the emergency room. KVT: Can parents help prevent kids' nosebleeds? RH: The simple things are, keep the nose nice and moist with saline nasal sprays. I also recommend using ointment, such as Bacitracin, Neosporin antibiotic ointment or Vaseline. Apply it with a cotton swab or your finger and then spread it around the inside of the nostrils. In winter, be sure that kids drink plenty of fluids and use a humidifier in their bedroom at night. KVT: At what point should parents seek medical help? RH: It's completely individualized. I'd start with the child's primary care physician. They can take care of most of these problems. KVT: What can you do to correct the problem? RH: From my standpoint, I can look in there and see if there are any blood vessels that can be cauterized [sealed off by burning or freezing]. Of course, that's entirely age dependent. If they're little, often we can't do that in the office. So we have to figure out how often they're having nosebleeds, how long they last, how much it is affecting the family's daily activities, and then we decide what to do. Occasionally I take them to the operating room to cauterize the vessels. In those cases, the child has to be sedated. KVT: Can nosebleeds be an early indicator of underlying health problems? RH: I take a good medical history to see if there's any family history of bleeding disorders just to rule those out. For example, does the child have any other problems such as easy bruising? Only then do we decide to order some blood work just to make sure their clotting functions are OK.
KVT: Are there any other reasons why kids might be getting frequent nosebleeds? RH: You can certainly have some benign tumors, but those would be very rare. We worry more about those things in teenagers, especially male teenagers. With young kids, this is standard stuff and nothing for parents to worry about. Most kids outgrow this problem.